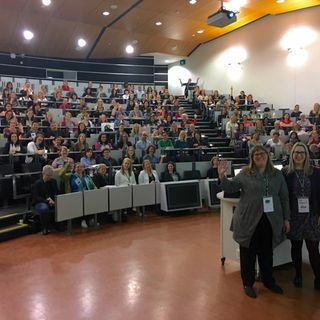 Note: you should also listen to part 1 and part 2 of the #WiDSWellington 2019 Speaker series. The day of the event and we got to catch-up with a staaaaaack of people including ALL of the speakers not already represented on the podcast (see above), and all of the exhibitors. With so many people we asked 3 simple questions 1) Who are you; 2) Who are you representing; 3) Why this event? With so many people to talk with this is both a long podcast AND we have added timestamps / chapters for you ... See More to skootle forward to the people you want to hear from. Fiona Thomson (Analytics Manager at the Social Investment Agency) with colleagues Akaliesh and Simon. Akash Jattan representing Revera and Qrious. Dr Sally (Ake) Nicholas – lecturer in linguistics at Massey University. Mandy and Andrew from Red Hat. Dr Kathryn Hempstalk – Head of Data and Insights at Trade Me. Nasca Peng – Nasca is a statistical analyst and the leader of confidentiality network in Stats NZ. Vidette McGregor – Group Manager of the Population Modelling group at NIWA. Liz MacPherson – Government Statistician, Chief Executive of Stats NZ, and the Governent’’s Chief Data Steward. Sunesh Samarasingh from Enterprise IT. Evelyn and Antonia from MBIE. 22.12: Sponsor: Revera and Qrious.